The Hunger Games series 2nd installment, Catching Fire, has just recently hit the cinemas. Have you seen it already? Please do! This movie has received very positive reviews from critics, and fans all over the world are already eagerly awaiting the first part of its third and final installment, Mockingjay, on November 2014 (yes, Book 3 will be split into 2 films) – the second part will be shown November 2015. The gowns worn by Katniss Everdeen in this film are bold, high-fashion and absolutely to die-for. Wait til you see her “wedding dress” which I’ll be sharing with you now! 🙂 This gorgeous piece of perfection was designed by Jakartan designer Tex Saverio. 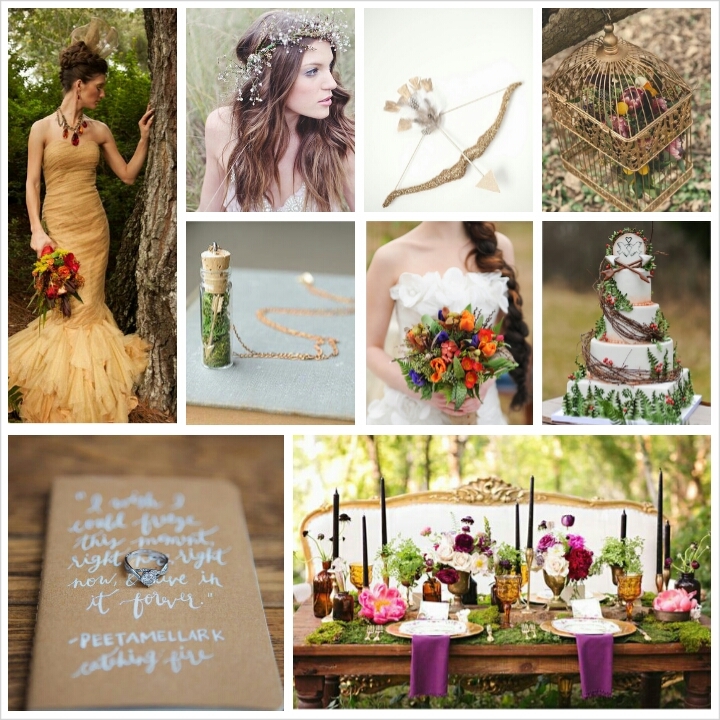 If you are bold and edgy like Katniss Everdeen, then I dare you to have the The Hunger Games movie inspired wedding! This wedding will be rich with natural elements and will have a bold and deeper hued palette. This wedding will be raw and unapologetic, fierce and sublime. If you think you have what it takes to carry out a Woodland Chic wedding worthy to be talked about, then look no more and steal these The Hunger Games wedding inspirations below! My most fave deet on this mood board will be the woodland chic floral crown, which is very raw, organic and totally imperfectly lovely. Another piece of deet I love as well is the delicate arrow and moss necklace, which I think would be a perfect wedding favor for your guests or as a bridesmaid’s gift.